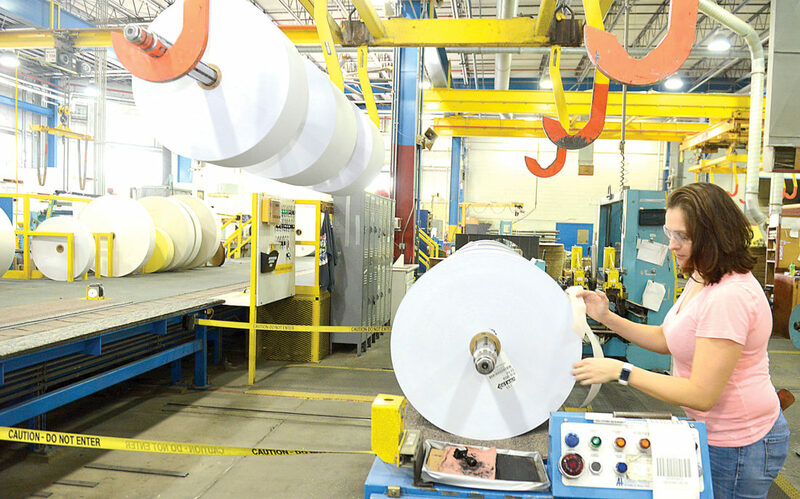 Mirror photo by Gary M. Baranec Dawn Varner of Roaring Spring labels rolls of paper at the Appvion paper mill in Roaring Spring. When the mill’s France-based owners announced plans to sell their American subsidiary, Appleton Papers, in 2001, workers across the country pitched in to take control of the company, forming a worker-owned corporation — now called Appvion Inc. Approach nearly any small town in central Pennsylvania and you’re likely to see one of two things. If the town is lucky — like Roaring Spring or Tyrone — you will see plumes of steam and full parking lots at an industrial landmark. If it’s not — as in Saxton in recent years — you will see a shuttered factory, “for sale” signs and all the attendant markers of a town whose industry has died. The story of the Rust Belt, the wide expanse of Great Lakes and Midwestern cities, is one of decadeslong manufacturing decline. But while the Rust Belt’s large and medium-sized cities have often managed to claw their way back to a growing economy, small towns with just one or two employers can remain desolate for decades. The paths they have taken to survive and grow can serve as examples for those still reeling in a post-industrial era. Some have preserved their old industries in a smaller, more high-tech form; others have shifted gears completely. And some remain seemingly unable to recover. “It’s almost kind of a spiritual thing,” said Saxton Mayor Alan Smith, whose Bedford County town lost its largest employer, a car upholstery manufacturer, about nine years ago. Today, Saxton is looking to the medical marijuana industry to restore at least a fraction of its old jobs. The loss of industry in northeastern and midwestern towns is often demonstrated visually: huge, empty steel mills and shipyards in cities like Pittsburgh, Philadelphia and Detroit. But many of the changes have hit smaller towns with just a few thousand people, often many miles from metropolitan areas. In the decades after the 1950s, dozens of Pennsylvania counties not touching Pittsburgh and Philadelphia lost manufacturing work with many shedding more than half their manufacturing jobs by the early 21st century. During the first 13 years of the century, non-metropolitan counties nationwide grew far more slowly than large and small cities — with rural areas shrinking overall for several of those years. Since 2001, Pennsylvania in total has lost 300,000 manufacturing jobs — 34 percent of its base, according to the Bureau of Labor Statistics. The decline hit different towns at different times, but the story is often similar. A major factory or cluster of factories closes or shrinks as jobs are automated or sent overseas. In some cases, another business takes their place for a time, but rarely equals its predecessor. Claysburg lost most of its refractories — mills that produced silica bricks used in steel production — gradually by the 1980s. Mount Union followed the same path, its population declining from nearly 5,000 in 1930 to less than 2,400 today. Williamsburg’s Westvaco paper mill closed in the 1970s. Saxton lost its coal industry, then its power plants and finally its Seton Co. upholstery factory over a period of decades. And a slew of small coal towns in Cambria County and the Broad Top area, many founded by companies for a single purpose, have been left without their original industries for decades. That can lead to not only a depressed economy, but a demoralized populace. A single large factory or power plant could once sustain not only hundreds of well-paying jobs, but an entire economy, Smith of Saxton said. Saxton went through several industries, eventually settling in with the upholstery factory that employed some 1,200 people by the early 2000s. When the plant closed, the town was left without its signature business. Store closures followed, along with local ripples of the nationwide opioid crisis, Smith said. In many communities like Saxton, an aging population and a waning community spirit meant less interest in clubs, churches and children’s sports. “When there is not the prospect or opportunity for meaningful employment, which in turn means families and home ownership, I think it creates a sense of despair and some degree of hopelessness,” he said. In Claysburg, the decline of silica bricks was years in the making as steel waned across the country, said Rich Allison, a community activist and historian who once was president of General Refractories. The mills closed for months at a time, leaving workers without the security they’d once enjoyed. One refractory remains in neighboring Sproul with about 80 workers, he said. But that’s a fraction of the industry’s strength at its height. Not every small town took those hits, however. And some that did managed to survive by other means — in some cases fighting to keep their factories or bring them back into operation within a few years. When Westvaco closed its Tyrone paper mill’s doors on Oct. 26, 2001, local leaders didn’t know what to do. The closure shed 265 jobs and left a sprawling industrial center closed, but officials weren’t even certain the site would be put up for sale, according to Mirror interviews at the time. Two years later, a group of area business figures and investors united to buy the property and reopen the site under a new name: American Eagle Paper Mills. Today, according to company literature, the mill employs about 240 people — fewer than at its height, but a sizable economic force for a town of a few thousand. At the other end of Blair County, Roaring Spring has long relied on paper as its sustaining industry. The borough’s history has been intertwined with Roaring Spring Blank Book Co. since 1887, and the nearby Appvion paper mill’s smokestacks are recognizable from any direction. When the mill’s France-based owners announced plans to sell their American subsidiary, Appleton Papers, in 2001, workers in towns like Roaring Spring were left at risk. But employees across the country pitched in to take control of the company, forming a worker-owned corporation — now called Appvion Inc. — that still operates the plant today. In Bedford, bicycle manufacturer Cannondale announced plans in 2009 to close a facility and lay off hundreds of employees as work moved overseas. Officials in Bedford County managed to lure new manufacturers and high-tech businesses to county parks in recent years, maintaining an industrial base along the highways that pass the borough. Not every town has been so lucky, however. In many cases, there is little hope of preserving a local industry. Instead, local leaders have to branch out into unfamiliar new fields in hopes of weathering change. That’s what officials have attempted in Mount Union. Once a thriving silica center nicknamed “Bricktown,” the town lost its industry and the bulk of its population in the same downturn that struck Claysburg. Since then — with involvement and county business agencies — the borough has secured new, high-tech industry, said Bob Reitman, executive director of Huntingdon County Business & Industry. Reitman pointed to companies like ACProducts Inc., which operates a cabinet factory in the town. Locals and workers welcome any new business, but automation often means new industries employ far fewer locals than their predecessors. Reitman said county officials have filled a business park near Huntingdon and are still working to revitalize Mount Union’s business district. But where larger cities like Altoona can rely on booming fields like medicine and education, those like Mount Union don’t often have as many options. Claysburg has managed to climb back from its silica brick decline with a collection of other industries. NPC Inc., a print and digital company that distributes communication materials, is a community fixture, as is Shirley’s Cookie Co., an industrial-scale dessert producer. But Claysburg’s fastest-growing employer is likely Sheetz Inc., which has established an office complex, distribution center and employee wellness building in the community. As of a couple of years ago, Allison said, Sheetz employed some 1,200 people in Claysburg — a number that keeps growing as the company establishes new operations there. It’s not simply a matter of convincing new industries and companies to move into a post-industrial town, said Steve McKnight, president and CEO of the Altoona-Blair County Development Corp., which controls several business parks across the county. McKnight said the broad trend today is for more a diverse, broad industry spread across a city or town. Visitors might not see a single towering mill or factory anymore, he said, but a collection of less noticeable companies can still operate across a community. For those that have not yet got those industries, an aging population with pensions, Social Security payments and property can buy some time and support an economy, said Smith of Saxton. But sooner a later, a town needs a new industry. In Saxton, that could soon be medial marijuana as Maryland-based Green Leaf Medical LLC finalizes a deal to take over the shuttered Seton plant. The company’s director said he would first hire only 15 or 20 employees if it gets a state license to grow the plant — a tiny fraction of the jobs the building once supported. But officials hope the operation would grow, eventually inspiring other businesses to rent space in the sprawling former factory. For small towns, hope for the future can be an important resource in itself, Smith said.